BBC Latest News - Doctor Who - Dark Day: Daleks, Davros or a Giant Space Octopus? Dark Day: Daleks, Davros or a Giant Space Octopus? Did the Axons get their claws into the sun? Last week we shared some of your suggestions about what could have caused Dark Day. Today, we delve into our electronic postbag and pull out a few more fantastic, funny and highly imaginative ideas! Nadia, a Danish Doctor Who fan, had an ingenious idea that the sun was a prison, its ‘flames’ were a barrier and the darkness was caused when the sun’s prisoners lowered this solar ‘barrier’ and made good their escape. Ingenious! Nicola told us, ‘The Vashta Nerada swarmed into our atmosphere ready to feast on humanity, but left to follow a passing fleet of Judoon instead (much more meat! )’ Well, nice to know the Judoon can do humanity a favour now and again! 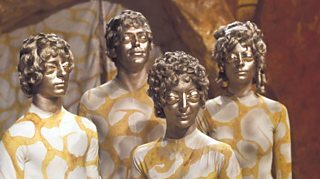 And finally for today, one of the most epic ideas came from JG: ‘The Last Great Time War between the great planets of Gallifrey and Skaro created ripples that had an effect on history… and all planets have weak spots in history. May 19th, 1780 was Earth's weak spot. The Time War threatened to destroy Earth so the Doctor created a Blackout Shield to protect the Earth, but the Doctor couldn't save all the planets using this Blackout shield. Some perished, never to be seen again. But we all remember the Doctor's heroic deed on Earth as Dark Day.’ Marvellous! Thanks again to everyone who got into the spirit of this with such inventive suggestions! We’ll be sharing a third and final batch of your ideas soon! The Doctor is Back: Today at 5:45pm!